I wanted to make my grandson’s birthday cake this year. 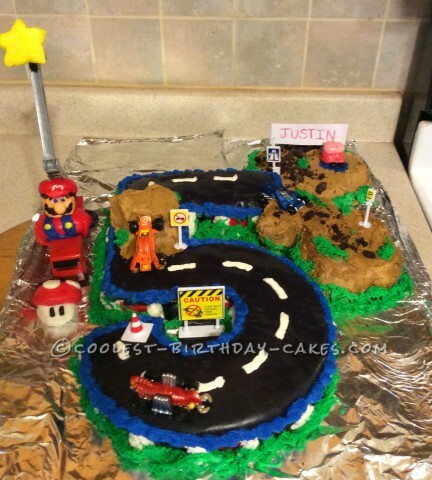 He absolutely loves cars, race tracks and mud, so I decided to build a cake around that theme. I baked two cakes. One was in a round 9′ cake pan and the other in a 9×11′ pan. After both were baked and cooled, I cut a circle in the round pan, then cut a chunk out to resemble a “C”. Using the cake from the 9×11″, I made straight cuts to build and complete a number 5. I covered the cake in a homemade marshmallow fondant using black for the top and black and white checkered for the sides. Any little flaw was easily covered with some homemade buttercream frosting colored in red. Using some leftover cake, I made a ramp on top of the cake and 2 mud piles on the side of the cake. Brown buttercream frosting and crushed cookies for dirt. I piped green buttercream frosting grass around all the edges and made white buttercream lines on the road. 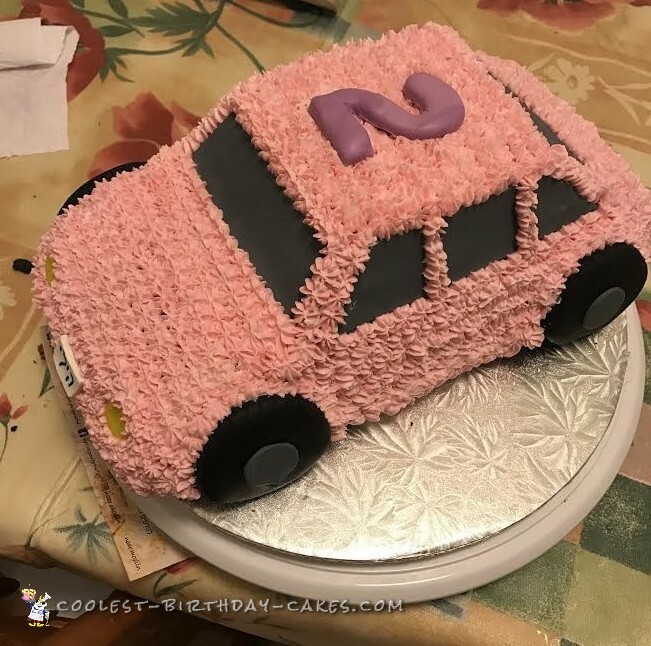 I placed cars and signs around the cake. I wrote his name on a piece of paper and wrapped it around 2 toothpicks that stuck in the cake. My grandson also loves Peppa Pig and Mario, so I made some fondant figurines to add to the cake. Peppa pig was the cheerleader and Mario was on standby in the fire truck. Everything but the cars, and signs were edible. It was so fun to decorate this cake and all I could think about is how my grandson would react when he saw it. When I presented it to him on his birthday, he was ecstatic. He couldn’t decide what he wanted to do first; play with it or eat it. After carefully looking it over and checking all aspects of the cake out, he took all of the cars off and one by one put them back on racing them around the track making car noises. The time invested to make this cake was so worth it for me. Priceless. 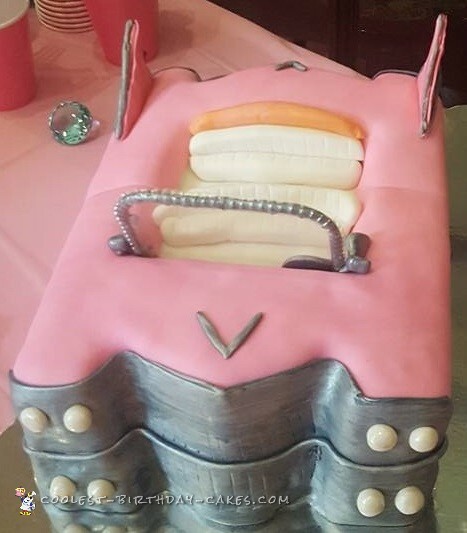 Birthday cake idea Posted by Michelle F.
I was asked to make a 59 pink Cadillac cake for my cousin’s 13th birthday.